The Bachelor of Arts (BA) degree is designed for a student who seeks a solid background in chemistry in order to enter medical school or some other field related to chemistry. The program may also be enhanced by additional chemistry electives to provide the background necessary for admission to graduate programs in chemistry. The BA degree can fulfill the requirements of the American Chemical Society (ACS) for ACS certification upon taking additional courses, including additional laboratory experience. 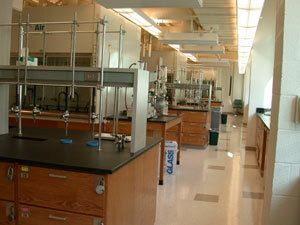 The Department of Chemistry is part of the College of Arts and Sciences at Case Western Reserve University. As common to all degree programs within the college, the BA degree candidates must fulfill 39 credits of coursework for the SAGES requirements. An additional 31-32 credit hours must be accumulated in chemistry courses. Additional credits of math and science courses must also be taken. The remaining 45-46 credits are available for electives to allow the student to either specialize in pre-professional areas or to earn a second degree. Select a component in the following table to learn more about it. The recommended sequence of science and math courses required to complete the BA program will help you plan your academic career. You may also find a complete listing of chemistry courses helpful in your planning. Note: CHEM 305, CHEM 306, and CHEM 332 are approved departmental seminar courses. Chemistry and Chemical Biology majors do not have to take any other courses to fulfill the departmental seminar SAGES requirement.